This article is about the television channel in England, Wales and southern Scotland. For the ITV Network as a whole, see ITV (TV network). For the regional franchise serving Scotland, see STV (TV channel). For the regional franchise serving Northern Ireland, see UTV (TV channel). For the channel's owner, see ITV plc. The ITV1 name was only used in England, Wales, Southern Scotland and Isle of Man until Channel Television adopted the name in January 2006, bringing it to the Channel Islands. As national continuity is often used on Channel Television, ITV1 national branding had been seen on the station for several years previously. The licencees that used the ITV brand were Anglia Television, Border Television, Carlton Television, Central Independent Television, Channel Television, Granada Television, HTV, London Weekend Television, Meridian Television, Tyne Tees Television, Westcountry Television and Yorkshire Television. ITV Wales & West was the only exception, using the name ITV1 Wales at all times for the Welsh part of its broadcast area as it has a higher regional commitment. Latterly the ITV1 Wales name was only used on breakbumpers and regionally advertised programmes until 2013. Non ITV plc-owned licencees on the network generally did not refer to the ITV name. ITV was formed by the unification of eleven of the ITV licences. The Broadcasting Act 1990 changed many of the rules regulating the ITV Network, which most notably relaxed franchise ownership and hours of production. However, as far back as 1974, Yorkshire Television and its North East neighbour, Tyne Tees Television, formally created Trident Television, a merged entity of the two companies. By 1981 due to regulation, the company was forced to de-merge; however, they resumed their alliance in 1993 as Yorkshire-Tyne Tees Television, which therefore owned the two franchises and integrated the two company's assets more than its predecessor. There was no movement in the take-over of franchises until 2000 when Border Television and all of its radio assets were sold to Capital Radio Group, who consequently sold the television broadcasting arm to Granada Media Group. Granada then went on to purchase all of UNM's television interests (including its ITV franchises), which brought Meridian, Anglia and HTV into its power, but due to regulation Granada was forced to sell HTV to Carlton. By this time, all of the franchises in England and Wales were owned by either Carlton or Granada. In 2004, Granada plc officially merged with Carlton Communications, creating ITV plc, although it was a takeover by Granada in effect. In 2011, ITV plc acquired Channel Television from its private owners Yattendon Group plc. On 19 October 2015 ITV announced they were to buy UTV for £100million subject to regulatory approval. The deal also included UTV Ireland, UTV's Irish channel. Unlike other ITV franchises owned by ITV plc that use the ITV name, the UTV name will be retained. Since 27 October 2002, on all ITV plc-owned franchises, regional programming has been preceded or plugged by an oral regional announcement, in the format ITV1 regional brand, e.g. ITV1 Granada. In English regions, up until 13 November 2006, regional names were also superimposed (post-production) on these idents below the ITV1 logo, but this practice has since ceased. ITV Wales remains unaffected and still continues to use dual-branding across all of its on-screen presentation. Despite the lack of regional names on screen, the regional name is usually spoken by the announcer prior to local programmes. After ITV's unification in 2002, the two London franchises, Carlton Television and London Weekend Television were merged into a single entity, ITV London, while the Wales and West franchise lost its official identity and instead was substituted with ITV Wales and ITV West on-air, with no reference linking the two together (the licence was formally split in two by Ofcom from 1 January 2014). In the English regions, the channel has been known from 2006 until 2013 as ITV1 and since 14 January 2013 as ITV at all times. Regional references no longer appear before any programming at all in these areas. ITV channels are available on cable and IPTV in Switzerland and Liechtenstein. In the Republic of Ireland, ITV (as UTV) was widely available, however, UTV Ireland was launched in 2015 and replaced UTV in the Republic of Ireland. In 1999, another second common presentation package (once again using dual-branding with the ITV name) was launched, under the theme, "TV from the Heart". Like the 1989 attempt, a version was created for every franchise holder, but it was only taken by nine of the fifteen ITV broadcasters, two of which resorted to other designs, being London Weekend Television, which actually used the look for a year but then adopted a more original look (claiming it "wasn't exciting enough"), and HTV which adopted Carlton's identity [Note 1] when it was purchased by the company in 2001. Carlton, owner of three ITV licences at the time, did not adopt the generic look and instead used another package designed by Lambie-Nairn, which again followed the "TV from the Heart" theme, but with more emphasis on the Carlton corporate identity. By 2001, all eleven franchises of England and Wales were owned by either Granada plc or Carlton Communications, and a new common name, ITV1, was launched on 11 August 2001 because of the secondary channel ITV2 on the air. The existing "Hearts" idents were simply re-edited. In January 2006, the channel adopted a new on-air look, designed mainly to improve cross-channel promotion across ITV's multichannel presence. The new logo brought ITV1, ITV2 and ITV3 in line with ITV4's, and had been observed on various billboard ads in the UK when the new identity was first used on-screen on 16 January 2006. The overhaul also put an end to the former ITV Day brand, which was axed in favour of a full-time ITV1 identity. On 3 September 2007, four more idents were added to the set, featuring 'Bubbles', 'Fountains', 'Garden' and 'Buildings', and as of 19 September 2009, all now have 'the brighter side' on their breakbumpers. On 9 April 2010, four more idents where added to the set, 'Lanterns', 'Sunflowers', 'Snakes and Ladders' and 'Dodgems', featuring an updated ITV1 logo as seen on ITV1 HD. In September 2009 ITV plc announced that ITV1 +1, a one-hour time-shift version of ITV1, would launch in October 2009 from 10:25 am to 7 am daily. The hours covered by GMTV from 7 am to 10:25 am will not originally have been included in the relay. The channel launched on 11 January 2011. 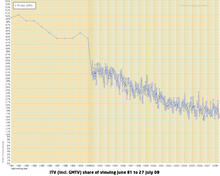 In 2005, ITV plc introduced a new channel branding called ITV Day, used to identify ITV1 between 9:25 am and 6 pm. ITV Day was treated as a separate entity to ITV1 and featured its own presentation set focusing using the colours of red, orange and yellow and featured scenes of typical "daytime" activities. Promotions were used in a similar format to ITV1, and all daytime programmes advertised within ITV1 hours were branded with the ITV Day logo. A similar "UTV Day" branding was adopted in Northern Ireland. The branding was scrapped in January 2006 when the ITV corporate rebrand took place. On 14 January 2013, ITV unveiled a major overhaul of its branding, including a new corporate logo inspired by handwriting, and the renaming of the flagship channel back from "ITV1" to just "ITV". Its color schemes vary on-air to compliment its surroundings—a practice referred to internally as "colour picking". Following the buyout in 2016, UTV also rebranded to these idents, using a tweaked version with the new UTV logo. On 1 January 2019, ITV launched a refresh of its current on-air presentation, with a more "crafted" appearance and use of layered "cut-outs" of the logo. Idents were also changed as part of a project known as "ITV Creates"—under which a new set of idents will be used weekly, built around interpretations of the ITV logo created by a British visual artist. The first artist featured as part of the series was Ravi Deepres. UTV continued with its 2013-era idents, but used the new on-air presentation, with a tweaked version to accommodate the UTV logo. ^ The opening films was retained, but the endings was in the "Hearts" style. Check TV Ark. ^ a b "The Carltonisation of ITV". Retrieved 26 May 2012. ^ "Grade hints at ITV region restructure". Digital Spy. 12 September 2007. Retrieved 12 September 2007. ^ "Confirmed: ITV HD is Freesat exclusive". Digital Spy. 6 May 2008. Retrieved 6 May 2008. ^ "HD version of ITV to launch next Spring". Digital Spy. 12 September 2007. Retrieved 12 September 2007. ^ "ITV HD will relaunch for Freeview HD". What Satellite & Digital TV. 7 August 2009. Archived from the original on 12 August 2009. ^ "ITV to wait for CRR ruling before launching +1 channel". AGB Nielsen Media Research. 3 September 2009. Archived from the original on 21 April 2012. ^ "ITV postpones ITV1+1 launch". Digital Spy. 18 September 2009. ^ "ITV1+1 data appears on Sky's EPG". Digital Spy. 17 September 2009. ^ "CRR decision put back as commission chews on submissions". Brand Republic. 2 December 2009. ^ "ITV given green light for +1 and HD channels under CRR". Media Week. 19 January 2010. ^ Sweney, Mark (12 May 2010). "ITV's CRR ad rules stay – for now". London: The Guardian. ^ "CC publishes final decision on PUBLISHES" (PDF). Competition Commission. 12 May 2010. Archived from the original (PDF) on 19 January 2012. ^ "ITV Statement In Response To The Competition Commission's Final Decision On Contract Rights Renewal (CRR)". ITV plc. 12 May 2010. Archived from the original on 14 June 2011. ^ "Lords to review ITV1's CRR mechanism". Digital Spy. 28 July 2010. ^ "ITV1+1 sets January launch date". Digital Spy. 14 December 2010. ^ "ITV1+1 to launch tonight". Digital Spy. 11 January 2011. ^ "ITV to launch ITV1+1 channel". Digital Spy. 1 September 2009. ^ Deans, Jason (13 November 2006). "ITV1 rolls out more idents". London: Guardian. Retrieved 6 June 2006. ^ "ITV1+1 to launch in October". Marketing Magazine. 2 September 2009. Retrieved 5 September 2009. ^ "ITV1 to become ITV in channel rebrand". The Daily Telegraph. 16 November 2012. Retrieved 16 November 2012. ^ Plunkett, John (14 January 2013). "ITV launches biggest on-screen rebrand in 12 years". The Guardian. ISSN 0261-3077. Retrieved 1 January 2019. ^ Meier, Dan. "ITV announces 2019 idents project". TVBEurope. Retrieved 1 January 2019. ^ Mann, Colin. "ITV: New on-screen identity project". advanced-television.com. Retrieved 1 January 2019.